The latest offering from real estate giant Emaar MGF, Palm Hills is a prime development master-planned by the internationally renowned architecture firm, ARCOP. Located in Sector 77, Gurgaon, along the National Highway 8, the project is close to all conveniences and important landmarks including the upcoming metro station, ISBT, Haldiram's, Wet & Wild and ITC Classic Golf Course. On offer are vaastu-complaint 3 and 4 BHK apartments ranging in size between 1450 and 1950 sq ft with refreshing views of Aravalli Hills. Each apartment has been efficiently planned to ensure maximum utilisation of space, while flexibility to change unit configuration assures that every home is tailored to the family's requirements. For instance, a simple step can transform a 4-bedroom unit into an ultra-spacious 3-bedroom unit with an optional study or a walk-in closet. With just two units in each floor, the apartments assure privacy. A number of recreational amenities have been planned within the complex. 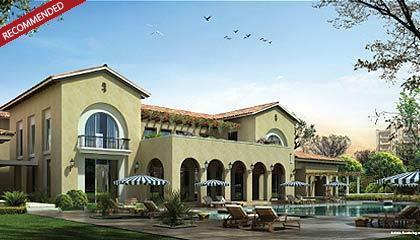 These include a clubhouse with gym, health club, swimming pool, salon and spa, outdoor sports, etc. Other important facilities close at hand include a community centre, business centre, shopping complex, convenience store and cafeteria. Extensive landscaping and plantations across the complex are another plus.